Robert Abbate teaches English composition and philosophy at Rowan-Cabarrus Community College in Concord, North Carolina. His most significant recognition in poetry came in 1982 when Carolyn Kizer selected five poems for the Katey Lehman Creative Writing Awards at Penn State University. His poems have appeared in such journals as Alehouse, Ruah, Sanskrit, Iodine Poetry Journal, The Main Street Rag, and Kakalak: An Anthology of Carolina Poets. He was one of the founding editors for Ruah in 1990, a poetry journal of spirituality at the Graduate Theological Union in Berkeley, California. His first full-length poetry manuscript was a finalist for the Bright Hill Press Poetry Book Contest in 2005 and a finalist for the John Ciardi Poetry Prize from BkMk Press in 2006. 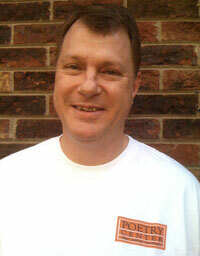 Robert’s poem “Tishbite Pottery Fragments” was a finalist for the 2007 James Hearst Poetry Award from the North American Review. In Courage of Straw Robert Abbate addresses forthrightly and steadily difficult issues of religious faith and personal relationships. From these materials he has drawn a fine-tuned formal music that sounds in the heart as resonantly as it sound to the ear. His formidable skills are always in the service of genuine feeling and rigorous thought-and of pleasure. A wonderful collection! Laced with allusions to Dante’s Inferno, Abbate’s collection presents a gallery of souls trapped in living hells: Matthew Shepard getting tortured and pistol-whipped, Giordano Bruno burning at the stake, three young brothers being immolated by a terrorist’s Molotov cocktail, Theodore Roethke undergoing electroshock, an Irish hunger striker experiencing the agonies of starvation. At home with these more modern poems are others that retell Biblical stories with similar themes of violence and vengeance. In Robert Abbate’s world, redemption arises not from symbolic ritual acts, but from the donation of a kidney by one human being to another, a gift of the sword and of blood. Yet it is also a world that never loses faith in the power of language to bear witness. 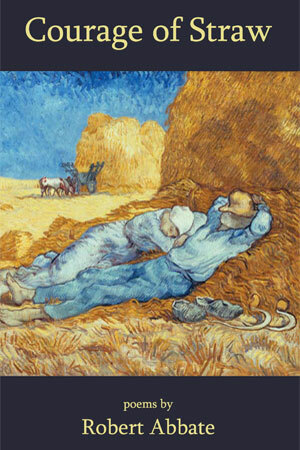 Though stark in its revelations of abuses afflicted upon the young, the saints and martyrs, Courage of Straw presents a tenderness woven with the strength of the heart’s affections and the mind’s brooding analysis. This collection is a scholarly forage for scraps of meaning, for grounding. Amid “fear and trembling,” Abbate makes difficult choices. At times as delicate as a strand of hair, his poems wrestle with angels! in the concrete floors, the steel bars and open toilet stalls. suits, except those clad in red, the violent offenders. who wear them around their necks like talismans. beyond the tomb of lock-down. their Divine Office a Litany of the Penal Code. stories like a bundle of bruised reeds. pages of Miserere flapping in the vindictive wind. while justice does not blot out the indelible crimes. drag themselves from bed to leap awake. his tendons, bruised his ribs, bent his shoulder blades flat. to the shower with my blessed doubt. they know fully what they do.